Seventh Grade CCD students adopt one of God’s children from Colombia, South America. In May, the Pius Players presents: I DO, I DO, followed by Neil Simon’s THE PRISONER OF SECOND AVENUE. Scheduled to follow during the year: MOON OVER MONTEVIDEO, THE MOUSETRAP and BARNUM with Father Tex as director. Continuing in a similar vein, at the conclusion of Catholic School week, Father Callahan is honored by our St. Pius X students with his very special “Man of the Year” award. As a memorial to Father Louis Stanislaus, carillon bells ring at Midnight Mass in his honor. Chapter 27 – A Celebration of New Beginnings! Miss ya, Father Larry! After seven years of priestly dedication and hard-working service, Father Larry accepts a new assignment. We welcome Jim McGuire, Father Bob McGuire’s 89 year old father who takes up residence in our House of Prayer. A new Associate Pastor moves into our rectory, Father Daniel Sheridan, who is a talented organist. Our third welcome mat is extended to Father Felix Weerasinghe, a native of Sri Lanka, who will also serve as hospital chaplain. Father Tex’s active “on loan” year at St. Pius X comes to an end. And another Senior Group, the Golden Glowers, is formed. Definitely! 1985 - a very busy year for the 30th anniversary of our parish family. A Celebration of New Beginnings! “Regina Verto Lumina” (Queen, guide us with your light). It is January 1986 when the Diocese of Rockville Centre announces the death of Bishop Walter P. Kellenberg, who had served our pioneer diocese for 20 years. John R. McGann, DD is appointed to undertake the formidable task of leadership. Pope John Paul II establishes the first World Youth Day in Rome, Italy. St. Pius X parish continues to develop in a changing society. Our CCD high school program joins Rabbi Perras and Fr. Sheridan to celebrate a Seder at St. Pius X. The Pius Players presents YOU CAN’T TAKE IT WITH YOU, ANYTHING GOES and THE MAN WHO CAME TO DINNER. Many of our CCD high school students attend a Day of Recollection at St. Ignatius Retreat House. St. Pius X School holds its first Golf Outing. And, John Snowden replaces Mrs. Joan Kawecki, who retires in June, after 18 years of creativity and dedication as our principal. Celebrating 1987 – “The Marian Year”. Many of us from St. Pius X ride the bus to the Shrine of the Immaculate Conception in Washington D.C. Oneta Phanithavong, husband and father of our Laotian family (who has been residing in our House of Prayer), has finally joined his family. After nine years in captivity, he escapes from his Communist captors in Laos. former parish by celebrating his first Mass after ordination at St. Pius X. Father Sheridan receives the “Karygma Award” from our Diocese. This award is bestowed on instructors of adult religious education. 1987, the second World Youth Day is held in Buenos Aires, Argentina. The Pius Players presents OKLAHOMA, CHAPTER TWO, THE ODD COUPLE and A CHRISTMAS CAROL. St. Pius X parish plans a trip to Rome in April ’88. Another young parishioner and graduate from St. Pius X School, Robert Romeo, has been ordained a priest in our Diocese. We ask God’s blessings on him and his family. Father Tom St. Pierre as our new Associate Pastor. The Rosary Society is reborn. The Pius Players presents STAR SPANGLED GIRL and CAROUSEL. The Bishop’s Appeal parish goal is now $32,400. In addition, Fr. Minturn announces a Raffle to help defray parish expenses. The Liturgy Committee preps our newly appointed Eucharistic Ministers with one year of training. Our parish initiates the St. Pius X Awards. A special Mass celebrates those couples who have been married for 25 years. To end the year, the K of C sponsors a Christmas Party for Religious Ed and we celebrate “Happy New Year 1990”, our 35th Anniversary. Our 1989 Confirmation class numbers 52 young people who prepare to become soldiers of God. The Diocese of Rockville Centre bestows awards to 13 parishioners from St. Pius X who have volunteered 12 years of dedicated service in the Bishops Appeal. After 12 years of active duty, Father Joe Minturn, our pastor (and financial wizard) accepts retirement. We welcome our fifth pastor, Father Hugh Cannon. The Pius Players presents its fifth summer musical, GUYS AND DOLLS. (People come from all over Long Island for tryouts.) Pope John Paul II celebrates World Youth Day at Santiago de Compostelo, Spain. Chapter 33 – Our 35th Anniversary! October 1990, the feast of Christ the King, Father Cannon celebrates Mass to commemorate our parish family’s Thirty-Fifth Anniversary. Father Tom St. Pierre accepts a new assignment. Our own St. Pius X Knights of Columbus Council # 10332 is established. Our K of C will live up to its high ideals of the Order: Charity, Unity and Fraternity via Scholarship Aid, Communion Breakfasts, annual Christmas events, Family Picnics, and so much more. The Hubble Space Telescope is placed in orbit. Internationally, Iraq invades Kuwait, leading to the 1991 Gulf War. The fourth World Youth Day is held at Czestochowa, Poland with Pope John Paul II. It is June 1991, the traditional time for diocesan changes in the clergy. Father Felix transfers from St. Pius X and we welcome Father Gerald Twomey as associate pastor. June ’92, Father Brian McNamara joins us as a weekend assistant. Hurricane Andrew kills 23 and causes $26.5 billion in long-lasting damage and destruction as it strikes Florida and Louisiana. Pope John Paul II holds World Youth Day in Denver, Colorado. Inauguration Day 1993 administers the oath of office to Bill Clinton, as our 42nd president of the USA. Our parish makes changes in our own history. 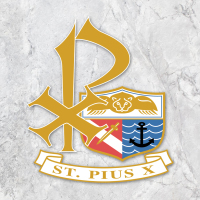 St. Pius X School has been witnessing a consistent enrollment decline. The Diocese of Rockville Centre decides to consolidate our school with three other Catholic grammar schools with depleting student population. St. Killian (Farmingdale), St. James (Seaford), St. Martin of Tours (Bethpage), St. Pius X (Plainview) enjoin to form St. John Baptist de la Salle Regional, with its campuses at Farmingdale and Bethpage. Bingo at St. Pius X soon ends after our school has closed. To assist in the support of our parish plant, we seek to rent sections of the vacated building. Eventually, we will house business offices for a psychologist and accountants, and two special schools for nursery-age and special education youngsters. The Auditorium continues to host successful CYO sports. Nevertheless, the large white brick Convent/House of Prayer continues to be vacant and is in need of repair and renovation. Father Twomey accepts a new appointment in June 1994. The following year, Father Moises Aimé (Haitian Ministry) takes up residence in our Rectory, to be available as a weekend assistant. 1995 marks our 40th anniversary. At St. Pius X, time marches on! Our new Senior Club is evidence of a maturing parish family. Programs and activities include “au courrant” guest speakers, trips to New York State and Pennsylvania, Belmont Park and Cape Cod. Our world in 1995-1996 has witnessed three bombings during a two-year span. 168 people are killed in the Oklahoma City bombing; Khobar Towers bombing leaves 19 U.S. servicemen dead in Saudi-Arabia; Centennial Olympic Park bombing in Atlanta kills 1 and injures 11. And, we cannot forget TWA flight 800 which explodes off Long Island, killing all 230 aboard. Manila, Philippines is the site for World Youth Day. 1996 we are assigned a new assistant pastor, Father Simon Palliparambil. Pope John Paul II celebrates World Youth Day 1997 in Paris, France. Our parish is overjoyed with news of parishioner, Guy Selvester’s ordination to the priesthood. We wish him and his family God’s continued blessings. 1998 Father David Mani, VA Chaplain at Northport takes residence in our Rectory. Civilization is witness to another bombing disaster. 224 people are killed in the bombings of our U.S. embassies in Tanzania and Kenya. 1999, into the second term of his administration, President Clinton is acquitted in his impeachment trial by the U.S. Senate. “People are made for happiness. Rightly, then, you thirst for happiness. Christ has the answer to this desire of yours. But he asks you to trust Him. 2000 – 2001 begins our Second Millennium. In a contested election, our nation calls George W. Bush to the Presidency. Pope John Paul II presides at a Jubilee Year World Youth Day in Rome. St Pius X Parish Family, Plainview, New York, DRVC, will celebrate its 45th anniversary on the feast of Christ the King. Statistically, our parish lists 1,505 households and the Religious Education program numbers under 400 young people. After 12 years as Pastor, Father Hugh Cannon accepts assignment to a parish in Suffolk County, and we are introduced to our sixth pastor, Monsignor Domenick Graziadio . September 11, 2001 becomes an infamous date in the history of our world with the terrorist attacks on the World Trade Center and The Pentagon. In January 2002, the Diocese announces the death of Bishop McGann. Pope John Paul II appoints James T. McHugh as third Bishop of our Diocese. Bishop McHugh dies less than a year after his appointment, and the Pope names Rockville Centre’s current leader of our Diocese, Bishop William Francis Murphy. Our parish congratulates newly ordained Father John Paul Joyce (Kevin Joyce). A former parishioner, and graduate of St. Pius X School, he is a member of The Intercessors of the Lamb, Omaha, Nebraska. Our parish summer fest takes on a new look as “The Feast” and we are introduced to the tasty menu of Café St. Pio. The annual Golf Outing commences in 2002. This all-day event which begins early on the day and concludes with a well-deserved and delicious dinner menu has become a well-attended parish activity, extending beyond the parish. Pope John Paul II presides at World Youth Day, Toronto, Canada. March 13, 2002, as he was saying Mass in his Lynbrook parish, Father Larry Penzes, a former St. Pius X Associate Pastor and a seated parishioner are killed by a deranged person. In 2003, Fathers Moises Amié and Simon Palliparambil transfer from our Rectory. (Father Simon will return in 2006 as an associate pastor, to resume residency at St. Pius X until June 2011, when he retires to Dominican Village, Amityville.) In 2004 we begin our Bereavement Ministry as a support group which provides for the needs of parishioners who have lost a loved one. 2005 – 2006 will be remembered as a era of renovation, rebuilding and re-dedication. St. Pius X Parish Family celebrates our Golden Jubilee. Msgr. Domenick arranges for the renewal of the Church interior. Stained glass artwork which had been removed from the vacated Convent building becomes part of the entry wall and doors. The glass-art portraits of Our Lord and St. Pius X, standing on each side of the symbols of Christ the King, command our attention. A side altar, dedicated to the Holy Family is constructed. A pair of ethereal Angels, painted on each side of The Crucified Christ beckons us to fix our gaze on our unique and dramatic masterpiece of a dying Christ on His Cross, extending Himself to all of us. The Parish Grotto of Our Lady of Lourdes is built in the garden in front of our Rectory. However, on April 2, 2005, the Vatican announces the passing of our world-beloved and revered Pope John Paul II who undoubtedly has been considered one of the most influential leaders of the 20th century. April 19, 2005, German-born Cardinal Joseph Aloisius Ratzinger is elected Pope Benedict XVI. At 78, he becomes the oldest person elected to the Papacy since Clement XII in 1730. He advocates a return to Christian values as the way to counter an ever-increasing secularization of the world, especially in the West. He presides at World Youth Day in Cologne, Germany. Our newly restored church is rededicated in October 2006, presided by Auxiliary Bishop Paul Walsh and Msgr. Domenick. Statistically, our 50 year old parish counts 1,412 households, with 417 young people participating in our Religious Education program. Faith Formation (Religious Education) continues its ministries to our parishioners, encompassing all facets of formation in, and teaching of, the Faith, regardless of age. This includes Baptism, Communion, Reconciliation, Confirmation, RCIA (Rite of Christian Initiation of Adults), and all aspects of formation involving youth, parents, adults and families – “from womb to tomb”. At St. Pius X, activities and events which have stemmed from our programs of Faith Formation include Baptisms, First Communion, Reconciliation (first Penance and seasonal Reconciliation with students), Confirmation, Children’s Eucharistic Adoration, Halloween Party, Breakfast w/Santa, monthly Family Mass Liturgy, Young Vincentians, Blessing of the Animals and more. July 2008 our parish family greets Father Dolphi Monteiro as our associate pastor. Father James Dineros, near retirement, takes a part-time residency at our Rectory and extends pastoral assistance on weekends until 2012. Election Day 2008 makes history by electing Barack Obama as our 44th President. Pope Benedict XVI presides over World Youth Day in Sydney, Australia. The Rosary Society witnesses a revitalization in 2009, and for a brief span of a year and a half a Rock Band Mass for young people participates at the Sunday 5 PM Mass. Catholic Ministries Appeal assessment is $38,400 and we continue to surpass this goal. Our K of C donates a Defibrillator to our Church. November 2009, Msgr. Domenick dedicates Room 1 of our School to deceased parishioner, Lucy Frenzel, a woman of much dedication and hard work in the forming of children and adults in the Catholic faith at St. Pius X’s Faith Formation program. Parishioner Dorothy Dean enters the Benedictine Order as Sister Dolores. The Health Care and Education Reconciliation Act of 2010 is signed into law. The “Don’t Ask, Don’t Tell” Repeal Act is signed into law, regarding homosexuals in the U.S. Armed Forces. Our parish family celebrates another milestone, our 55th Anniversary. April 2010, Father Dolphi returns to India for a pastoral assignment. Shortly after his arrival, we are shocked to hear the news he is killed in a road accident. 2011 in world history sees the onset of Civil War in Libya and documents the deaths of Libyan leader Muammar Gaddafi, who was captured and shot to death by NTC forces; and Al-Qaeda head, Osama bin Laden, who was killed by U.S. forces in Pakistan. Within the year, the last United States troops withdraw from Iraq under the terms of the U.S.-Iraq Status of Forces Agreement. Within our nation, in Tucson Arizona, we are horrified to witness an assassination attempt on Democratic Representative Gabrielle Giffords by a gunman who critically injures Giffords and kills six others. Pope Benedict presides over World Youth Day in Madrid, Spain. On our home front, our parish adjusts our weekend Mass schedule. Saturday, 5pm; Sunday, 8:30am, 10:30am, 12:30pm; Weekdays, 8:45am. The Women’s Circle is formed to provide a venue for women in the parish who seek to interact with peers regarding matters of motherhood and family life. Father Saul Londono takes residence at our Rectory for a brief stay. It is 2012. Our Diocese grimly announces the closing of several grammar schools, including St. John Baptist de la Salle Regional School, Farmingdale. Parents offer suggestions to maintain these Catholic schools, to no avail. More disappointing news for our parish and the community arrives with the announcement that after this summer’s festivities, the Feast will be put “on hold”. Late October, Super Storm Sandy kills at least 209 people in the Caribbean, Bahamas, the U.S. and Canada. Our eastern seaboard is socked with considerable damage and major disruption. Our 11th Golf Outing is dedicated to honor Msgr. Domenick Graziadio on the occasion of his retirement. In June, we welcome Father Xavier Lakra as Associate Pastor. February 2013, Pope Benedict XVI announces his retirement because of advancing age. On March 13, the Vatican introduces the world to newly elected Pope Francis, formerly Argentine Cardinal Jorge Mario Bergoglio. Pope Francis presides at World Youth Day in Rio de Janeiro, Brazil. The Vatican announces Pope John XXIII and Pope John Paul II will be declared Saints on April 27, 2014 at a ceremony that may see two living Popes honor two deceased Popes. Retired Pope Benedict XVI may join Pope Francis at the ceremony. Chapter 48 – Welcome Fr. Valentine! Msgr. Graziadio retires to private residence in June and St. Pius X parish family welcomes its seventh pastor, Father Valentine Rebello. At this same time, Father Chux Okochi, Ph.D. takes residence at our Rectory to join Father Valentine and Father Xavier. He will assist our parish on weekends. Father Valentine wastes little time “in getting to know us”. There is much repair work and renovation to be done. For over 30 years the former school building has housed our Rectory, Sports Auditorium, Madonna Hall meeting room/kitchen and several private businesses. Past and recent storms have caused considerable damage to rear walls and flooring. Our new Pastor with an entourage of skilled workers, manages to rebuild and repair within four months. Our K of C donates the new flooring in our Auditorium. Our Pastor refers to this project as “a resurrection of sorts”. Meanwhile, within these four months our parish family has enjoyed many celebrations and get-togethers. In August, we had the opportunity to interview our patron, St. Pius X, at a special Mass and Benediction, and a Reception which was held in the Church foyer. We remember the Tenth anniversary of September 11, 2001 with a special Mass, in which the Plainview Fire Department participates in full dress uniform. Our K of C and REP jointly host a reception for our new Pastor in Madonna Hall, as well as an end of summer picnic on our Church front lawn. The Feast of St. Francis of Assisi invites our pet animals to The Blessing of the Animals at the parish Grotto of Our Lady of Lourdes. We participate in an All Souls Mass of Remembrance and Reception for our parish family who passed in 2013. On November 10 at 12:30 Mass, Father John Derasmo, Dean of Deanery 5, installs Father Valentine Rebello as seventh Pastor of St. Pius X, Diocese of Rockville Centre. A reception to honor our parish volunteers is held on November 20. A revised Saturday/Sunday Mass schedule commences Saturday, November 30, /Sunday, December 1, 2013 (First Sunday of Advent). Saturday Masses: 8:45am, 3:45pm, 5:15pm. Sunday Masses: 7am, 8:30am, 10:30am, 12 Noon. Chapter 50 – A Visit from St. Pius X! Chapter 51 – Almost 60! St. Pius X Parish Family is fast approaching our 60th Anniversary. In 1955 the parish census had counted about 700 families, and about 1300 children, waiting eagerly to listen to, learn from and love Jesus and His teachings. November 2013, we count 1,408 households and 268 students in our Religious Education (Faith Formation) program. Through our small, yet energetic St. Pius X Church family, we became involved in the teachings and history of Catholicism. As pilgrims and pioneers we explored our religion and opened new doors. Almost 60 years later, we must continue to move to acceptance of our moral responsibility, to live our faith commitment, not because the Church says so, but because “we are the Church” and we have heard God’s call and we are responding. of preparation. With the acceptance of a job comes a responsibility. I have come to realize that this is the essence of the Christian work ethic.